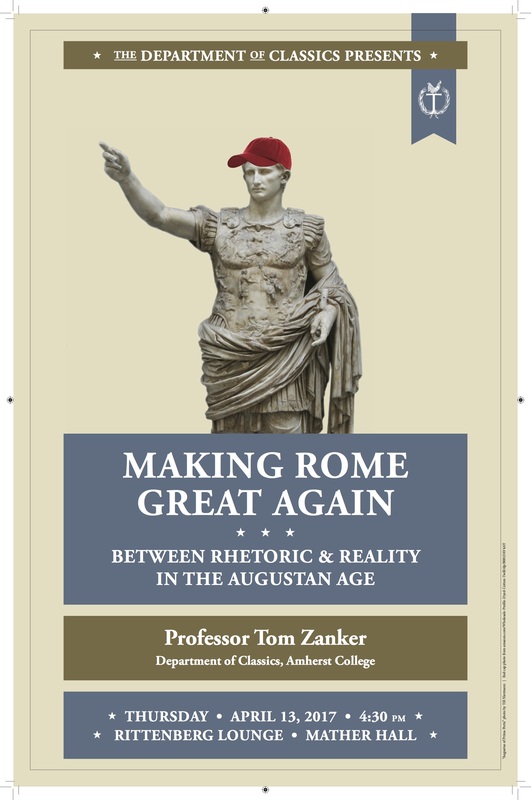 On Thursday April 13th 2017 at 4:30PM in the Rittenberg Lounge, Dr. Zanker of Amherst spoke to us about ancient Roman writers’ understanding of the golden age, an ideal time before their contemporary state of degradation. This entry was posted in Uncategorized on April 11, 2017 by vtomasso. 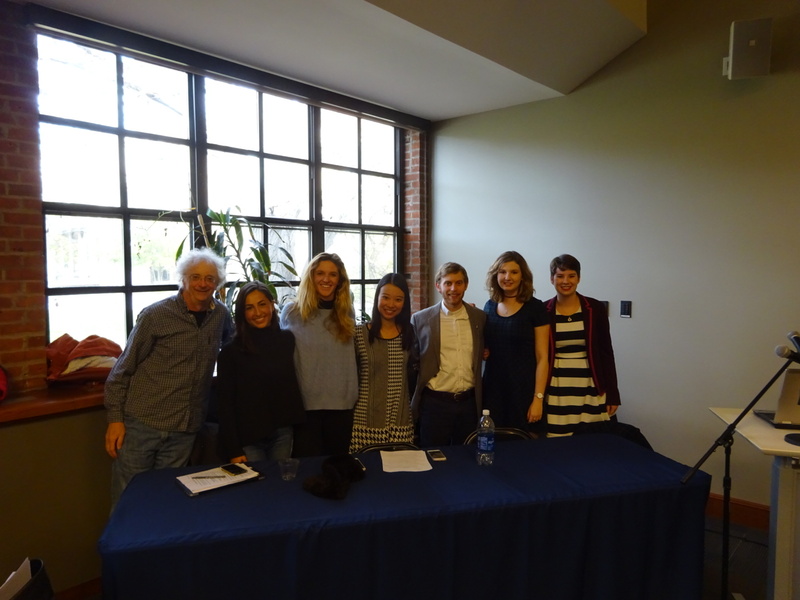 On December 8th 2016 seniors in Trinity’s department of Classics presented the fruits of their research that they conducted in Dr. Gary Reger’s senior seminar. 1. Caroline Mann on the depiction of leaders in antiquity and at the present moment. 2. Grace Gill on racism in antiquity. 3. Olivia Gibson on Italian dictator Mussolini’s use of the ancient Roman practice of the triumphal procession. 4. Joy Kim on elite Roman women in the public sphere. 5. 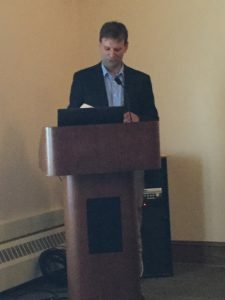 Matthew Reichelt on the interactions between native cultures in Babylon and Uruk and Greek culture in the Hellenistic period. 6. Maura Griffith on the use of Latin in the nomenclature of a species of algae in the early nineteenth century. This entry was posted in Uncategorized on April 10, 2017 by vtomasso. Trinity College Classics at ClassConn! 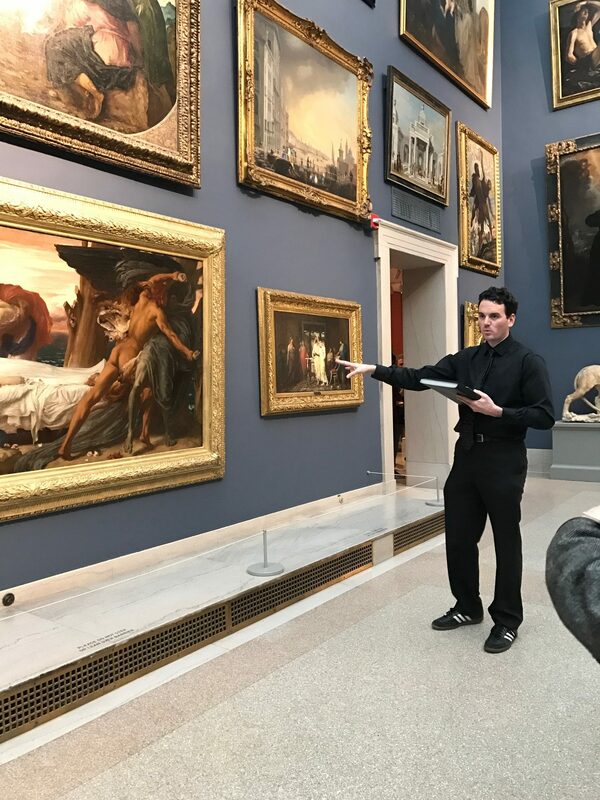 On Saturday April 8th 2017 the Classical Association of Connecticut (http://classconn.org/) held a saeclum event at the Wadsworth Atheneum museum in downtown Hartford. To celebrate 110 years as an organization in the state, ClassConn convened at the museum for two presentations by Trinity faculty, followed by a perusal of the museum, and a reception. ClassConn counts as its members high school Classics teachers as well as university professors. The first presentation was by Visiting Assistant Professor of History at Trinity, Dr. Lauren Caldwell. 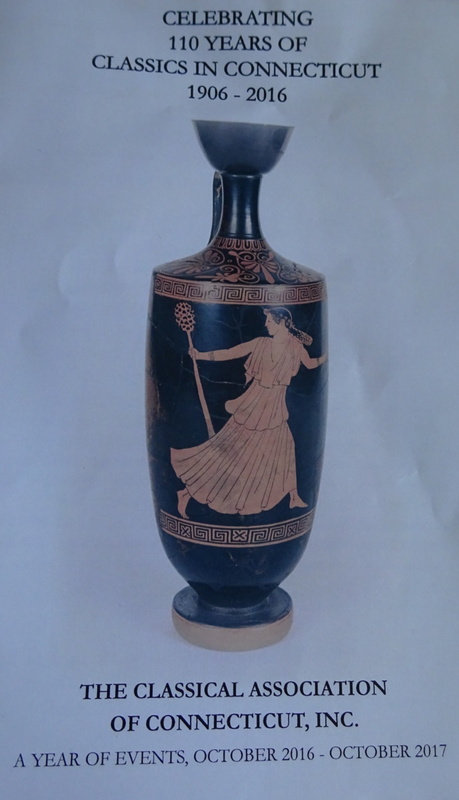 Dr. Caldwell employed her expertise in ancient Roman domestic life to elucidate four sections of painting that come from what she conjectured was the same villa in Italy. The scenes included one of nature scenes (ducks swimming and a fish swimming) and one of cupids. Dr. Caldwell speculated about the (unknown) placement of these paintings in the house, their audiences, and significance. The second presentation was by Assistant Professor of Classics at Trinity, Dr. Vince Tomasso. 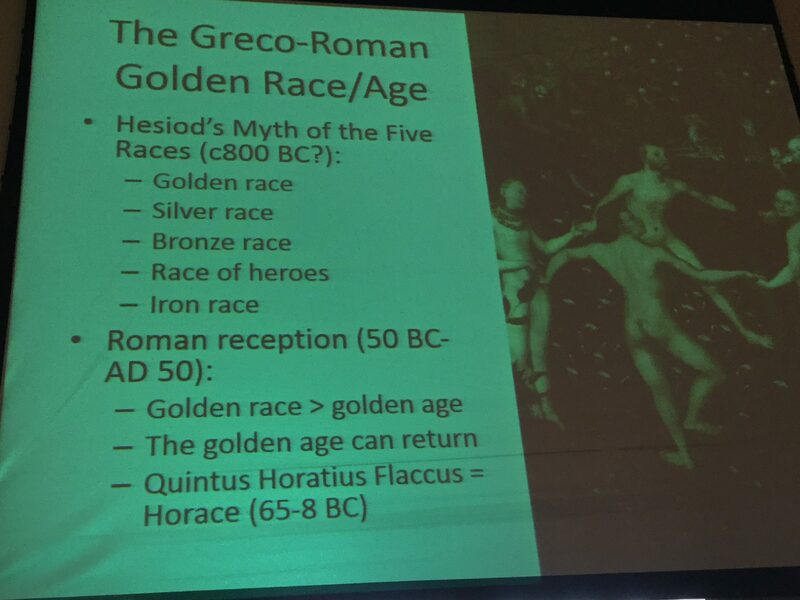 Hespoke about the reception of the figure Heracles, or Hercules as he’s most well-known in modern cultures. 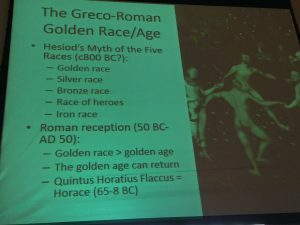 Linking a fifth-century BC Greek vase, a fourth-century BC Etruscan figurine, and a late nineteenth century painting of Hercules wrestling the god Death, Dr. Tomasso explained how Hercules’ meanings transformed in the different cultures that appropriated his image. 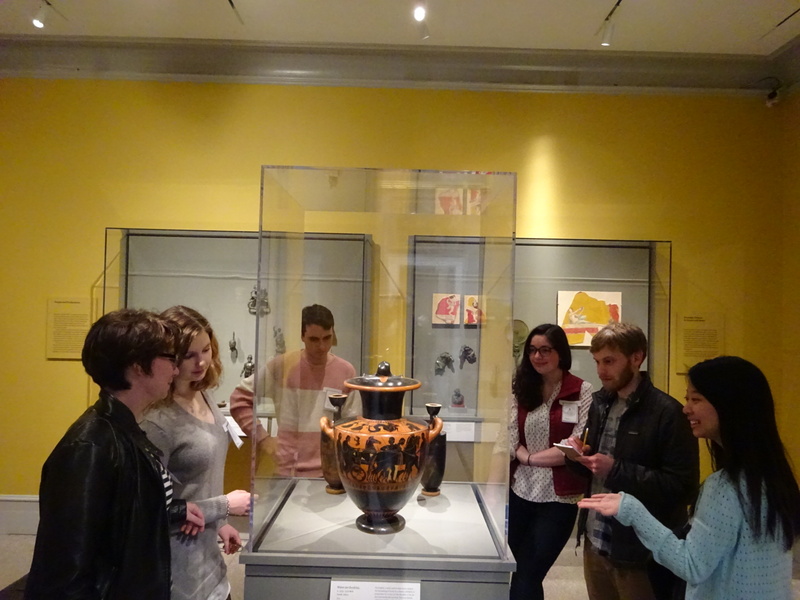 Trinity’s Classics Club made quite a showing as well and impressed other ClassConn attendees. Dr. Janna Israel, the Adult and Academic Programs Manager at the Wadsworth, and Geraldine Kuenkler, longtime member of ClassConn, coordinated the tour, which is part of a year-long series of events celebrating the organization’s anniversary. For more information about the Classical Association of Connecticut, including membership, grants, and upcoming events, check out http://classconn.org. 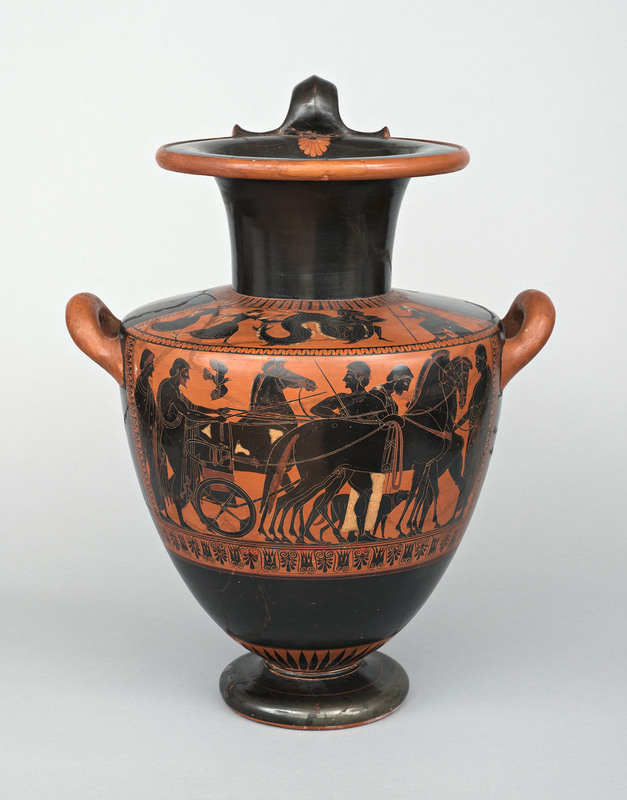 For images of Greek and Roman antiquities in the Wadsworth’s permanent collection, see https://thewadsworth.org/collection/.